The infrared radiant heater IR 2500 S instantly impresses with a top-class comfort function, namely the infinitely variable thermostat. Once set to the individual feel-good temperature, the device heats reliably and precisely to the point, then switches off automatically to save energy and back on when the temperature drops. Owing to its length of 870 mm and the heating capacity of 2,500 W this infrared radiant heater features a wide effective heating range. Due to the flexible attachment options, e.g. atop a telescopic tripod, this infrared radiant heater can also be used separately and temporarily for flexible applications at unsheltered locations out in the open. The functionality of the infrared radiator follows the natural principle of the sun. The heat rays do not heat the air, but instead the solid materials and objects they are directed at. These store the thermal energy which is later released in form of secondary radiation. Infrared radiation generates an agreeable sensation of warmth on the skin immediately upon switch-on. The IR 2500 S converts a great deal of the energy input into direct heat, which in comparison to a hot air blower increases the performance of the quartz radiator in terms of energy-efficiency. Seeing as the device further gets by without fan, it can supply the heat without generating odours, noise or raising dust. Which recommends the radiator as heating solution for allergy sufferers. The infrared radiant heater can quickly and easily be attached to wall, ceiling or telescopic tripod – for start-up the connection cable of the device is simply plugged into the nearest socket. With its aluminium housing and the robust design the IR 2500 S is also ideally suited for use in larger spaces such as storage facilities, marquees, market halls or sidewalk cafés. Another application would be on your terrace at home, where you can continue to enjoy sitting out of doors on mild summer nights or even in the time between seasons. 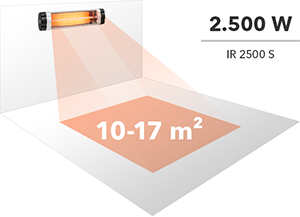 With a width of 870 mm and up to 2,500 watts of power the IR 2500 S can provide infrared heat for many possible applications. The infrared radiant heater can simply be mounted to the wall, to the ceiling or to a telescopic tripod. The infinitely variable thermostat renders setting the device to your individual feel-good temperature a breeze. The head of the radiant heater can be steplessly adjusted to an inclination angle of 90°. On events and private functions infrared radiant heaters provide direct heating for your guests that may have briefly gone out of doors without a coat. 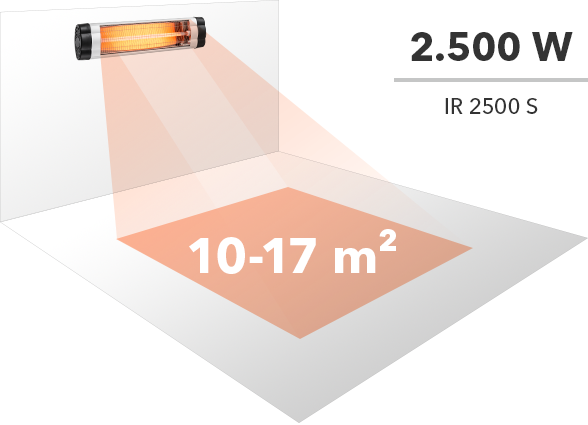 With its 2500 watts of heating capacity the IR 2500 S creates a pleasant sense of warmth even on the longer trading days. Nothing can beat the great outdoors! Enjoy convivial gatherings from spring through to autumn.